We rejoice with you as you prepare to enter into Holy Matrimony. You are preparing for a life time commitment. Thus the Church asks you to prepare for this major commitment by attending a preparation process that will address the theology of marriage; communication skills; etc. Your marriage preparation and wedding day are a holy time of prayer. You will be kept in our prayers. When things seem hectic or even out of control, know that you are being remembered in prayer. Your wedding day will take a great deal of preparation, and we are here to help since we have practical experience and are glad to share it with you. Remember to keep important things important. Important above all else is God’s love for you. God truly knows what really makes us happy, i.e., to live in His ways. We only think we know. Everything else will work out! Because this is a holy time, remember to pray. Attend Mass every Sunday and all other holy days of obligation; go to the Sacrament of Penance on a regular basis; read your bible and pray. There is no substitute for prayer. This will sustain you as you prepare for your wedding day and all the days of your married life. The Church has a rich theology on the sacrament of Matrimony. It stems from God himself, who entered into a lasting covenant relationship with his people. You can read the theology of Marriage in the Catechism of the Catholic Church, #1601-1666, here in parts, are brief points. The matrimonial covenant, by which a man and a woman establish between themselves a partnership of the whole of life, is by its nature ordered toward the good of the spouses, and of the procreation, and education of offspring; this covenant between baptized persons has been raised by Christ the Lord to the dignity of a sacrament. Therefore, marriage is not just a private relationship between two spouses, but a personal relationship lived out in society. As a social reality, marriage is also a Church reality. The Church believes this “intimate community of life and love which constitutes the married state has been established by the Creator and endowed by him with its own proper laws...God himself is the author of marriage. The vocation of marriage is written in the very nature of man and woman as they came from the hand of the Creator. God who created human beings out of love also calls us to love—the fundamental and innate vocation of every human being. Marital love becomes an image of the absolute and unfailing love with which God loves humanity. Thus, marriage is modeled on God unconditionally loving man and woman. The nature and purpose of every marriage is defined as: “The matrimonial covenant, by which a man and woman establish between themselves a partnership of the whole of life, is by its nature ordered toward the good of the spouses and the procreation and education of offspring.” This good of the spouse is understood that each spouse gives sacrificially of self to the total well being of each other and the marital partnership. Two essential properties of every marriage are unity (monogamous fidelity) and indissolubility (to make an unconditional, permanent commitment, lasting until the death of your spouse). These properties are rooted in Sacred Scripture and flow from the very nature of marriage as created by God (cf. Gn. 2:24; Mt. 19:3-9; Mk. 10:2-12; Lk. 16:18; 1 Cor. 7:2-6; 10-11, 39-40; Eph. 5:32; Rom.7:2-3). The Church holds the exchange of consent to be the indispensable element that "makes the marriage." If consent is lacking there is no marriage. The groom and bride give freely their consent to enter into this covenant of unconditional, sacrificial love. The priest or deacon who officiates at the ceremony is the official witness of this newly formed marriage; receives the couple’s consent in the name of the Church; and gives the Church’s blessing. The presence of the Church’s minister (and also of the witnesses) visibly expresses the fact that marriage is an ecclesial reality. The consent by which the spouses mutually give and receive one another is sealed by God himself. From their covenant arises "an institution, confirmed by the divine law,...even in the eyes of society." The covenant between the spouses is integrated into God's covenant with man: "Authentic married love is caught up into divine love." 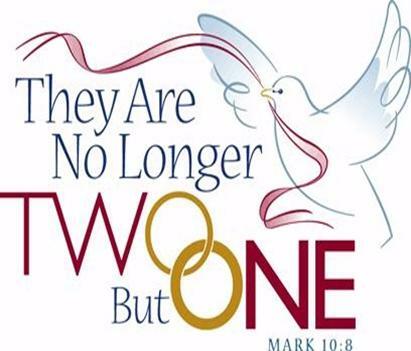 Thus the marriage bond has been established by God himself in such a way that a marriage concluded and consummated between baptized persons can never be dissolved. Just as with the other sacraments of the Church, there are particular graces provided in the sacrament of marriage. The grace proper to the sacrament of Matrimony is intended to perfect the couple's love and to strengthen their indissoluble unity. By this grace they "help one another to attain holiness in their married life and in welcoming and educating their children." Christ is the source of this grace. "Just as of old God encountered his people with a covenant of love and fidelity, so our Savior, the spouse of the Church, now encounters Christian spouses through the sacrament of Matrimony." Christ dwells with them, gives them the strength to take up their crosses to follow him, to rise again after they have fallen, to forgive one another, to bear another's burdens, to "be subject to one another out of reverence for Christ," and to love one another with supernatural, tender, and fruitful love. Click to learn more about the process of applying for a marriage annulment through the Catholic Church.